How does Sony manage to do it all the time? No, allow me to rephrase that. How does this franchise always manage to do it? How does it manage to not change its formula, but always win us over? God of War: Ghost of Sparta plays not much differently than the GOW games before it, and yet, we don't care. Has this franchise stumbled upon something that defies age? I'm not sure just yet, but what I do know is that I wholly enjoy this game. Much like every other God of War title, you're thrown into the eye of the storm immediately, so the game wastes no time in delivering the goods - and that's par for course. Traditionally, GOW games were never about long and tiresome training intros, and that's because the game is so accessible, there was never a need for them. Yes, occasionally you'll get gameplay hints towards the beginning, but they aren't very intrusive and allow the gamer to focus on the action. And that's what makes God of War so great. Not just this game, but the franchise as a whole. It has never strayed from what's made it a superb series in the first place; it never lost its focus. God of War never tried to be something more than a balls-to-the-wall, super fast, super violent action game, and I respect that. It never decided that it had to become an RPG midway through, or that it needed strategy elements. No. God of War's focus has always been: 'pressing a series of buttons makes the character furiously whip around and spill lots of blood'. Perfect. And those boss battles? Let's face it, the reason we love them so much isn't because of how epic they can be, but it's because of how gruesome the boss' death ends up being. Those are just some of the reasons why we love God of War, and all of the reasons continue to exist with Ghost of Sparta. The upgrades, the mayhem, the weapons, the boss battles, and even the always engrossing storyline - Ghost of Sparta continues the faithful God of War tradition of being the total package, despite coming in a package that only fits inside the UMD slot of your PSP. Perhaps the only drawback to all of this, and this may be considered a technical limitation, is that Ghost of Sparta is nowhere near as lengthy as other games in the series. The UMD can only store so much, and that impacts the length of the game to about eight hours. Though are a variety of challenge modes for you to partake in once you finish the game, which increase the amount of time you can spend with it considerably. Bar none, Ghost of Sparta is the best looking PSP game available today. The same way that the franchise has set a bar on the PlayStation 2 and PlayStation 3, it has done the same on the PSP. Chances are, considering the age of the PSP, it's unlikely a better looking game will come along and unseat Ghost of Sparta - I simply don't see it happening. So not only is Ghost of Sparta one of the best playing games for Sony's handheld, but it's the best looking one. Ready At Dawn has pushed this little unit to its limits by increasing the texture clarity, smoothing out the edges around game characters, allowing the framerate to run silky smooth, and employing some really spectacular effects. Chains of Olympus already looked great, but Ghost of Sparta simply looks better. If you're a God of War fan, you know what to expect from the audio. Voice acting courtesy of TC Carson, who continues to deliver some of the best voice acting this industry sees on the regular, in addition to a soundtrack that's made to raise your tension, thanks to its fully orchestrated arrangements. Ghost of Sparta's brilliance knows no bounds, as the audio will leave you in a more than satisfied state. I also found it best to have a pair of nice headphones plugged in while playing, because the audio simply sounds that much more rich when it's streaming directly into your ears, as opposed to the PSP's speakers. 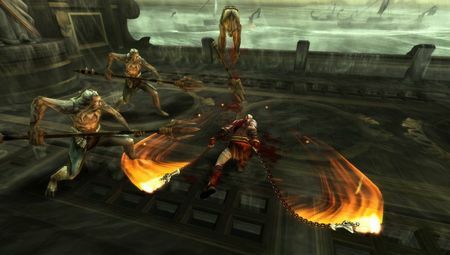 All in all, God of War: Ghost of Sparta is the PSP game you should have no reservations about. It's a well deserved $40 purchase that'll stay in your collection of portable titles for a long time. It's the ultimate example of the full console experience in the palm of your hands. God of War: Ghost of Sparta boasts everything you'd expect out of the franchise: superb visuals, great audio, massive gameplay, epic story, and great controls, all in a package that fits in the palm of your hand.